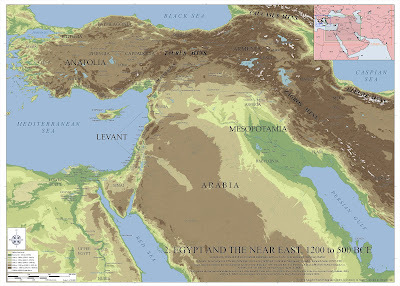 In 2011, Routledge published Wall Maps for the Ancient World, a series of seven maps which were created by the Ancient World Mapping Center (University of North Carolina, Chapel Hill). According to the center’s blog, the maps have gone out of print and now the rights have reverted back to the Ancient World Mapping Center. Yesterday, they announced they are making digital versions of the maps available to download. Most of the maps will be of interest to Bible students and readers of this blog. The announcement noted additionally that the digital version of map 6 “World of the New Testament” incorporates some minor corrections. You can read more about the maps and download them here. 1. Egypt and the Near East, 3000 to 1200 BCE. Scale: 1:1,750,000. 2. Egypt and the Near East, 1200 to 500 BCE. Scale: 1:1,750,000. 3. Greece and the Aegean in the Fifth Century BCE. Scale: 1:750,000. 4. Greece and Persia in the Time of Alexander the Great. Scale: 1:4,000,000. 5. Italy in the Mid-First Century CE. Scale: 1:775,000. 6. The World of the New Testament and the Journeys of Paul. Scale: 1:1,750,000. Inset “New Testament Palestine” (Scale 1:350,000). 7. The Roman Empire around 200 CE. Scale: 1:3,000,000. Hi, I want to download the maps but when I click on the download link, nothing happens. Any ideas what I should do to download? Randy - I am having the same problem. We're going to check into it, but in the meantime, you can download the maps with this temporary link. This link includes the 7 maps, but two of them (#3 and #5) are in low-res, despite what the AWMC website says. Thanks Todd, I downloaded them. Thanks for your download link, Todd. (I searched the AWMC site but couldn't find the maps there.) Those are fabulous maps! Any reason why maps 1 and 3 are only about 700KB while the others are are ~130MB? On the NT map, it's quite interesting that on Paul's 3rd journey, they have him going all the way across northern Greece on the Via Egnatia to Dyrrhachium and Apollonia then sailing the Adriatic and Gulf of Corinth to get to Corinth. It certainly is possible. Mark - My version of map 1 is 142 MB. It was maps 3 and 5 that were smaller (per Todd's comment above). We asked AWMC about this as well. The map of Paul's third journey in Mark Wilson's The Spirit Said Go also shows Paul traveling to Dyrrhachium. I wonder if Mark Wilson had any influence on AWMC's map or vice versa.